Ceres (; minor-planet designation: 1 Ceres) is the largest object in the asteroid belt that lies between the orbits of Mars and Jupiter, slightly closer to Mars's orbit. With a diameter of 945 km (587 mi), Ceres is the largest of the minor planets and the only dwarf planet inside Neptune's orbit. It is the 33rd-largest known body in the Solar System.Ceres is composed of rock and ice, and contains approximately one-third of the mass of the entire asteroid belt. Ceres is the only object in the asteroid belt known to be rounded by its own gravity, although detailed analysis was required to exclude Vesta. From Earth, the apparent magnitude of Ceres ranges from 6.7 to 9.3, peaking once at opposition every 15 to 16 months, which is its synodic period. Thus even at its brightest, it is too dim to be seen by the naked eye, except under extremely dark skies. The robotic NASA spacecraft Dawn entered orbit around Ceres on 6 March 2015. Pictures with a resolution previously unattained were taken during imaging sessions starting in January 2015 as Dawn approached Ceres, showing a cratered surface. Two distinct bright spots (or high-albedo features) inside a crater (different from the bright spots observed in earlier Hubble images) were seen in a 19 February 2015 image, leading to speculation about a possible cryovolcanic origin or outgassing. On 3 March 2015, a NASA spokesperson said the spots are consistent with highly reflective materials containing ice or salts, but that cryovolcanism is unlikely. However, on 2 September 2016, scientists from the Dawn team claimed in a Science paper that a massive cryovolcano called Ahuna Mons is the strongest evidence yet for the existence of these mysterious formations. On 11 May 2015, NASA released a higher-resolution image showing that, instead of one or two spots, there are actually several. On 9 December 2015, NASA scientists reported that the bright spots on Ceres may be related to a type of salt, particularly a form of brine containing magnesium sulfate hexahydrite (MgSO4·6H2O); the spots were also found to be associated with ammonia-rich clays. In June 2016, near-infrared spectra of these bright areas were found to be consistent with a large amount of sodium carbonate (Na2CO3), implying that recent geologic activity was probably involved in the creation of the bright spots. In July 2018, NASA released a comparison of physical features found on Ceres with similar ones present on Earth. From June to October 2018, Dawn orbited Ceres from as close as 35 km (22 mi) and as far away as 4,000 km (2,500 mi). The Dawn mission ended on 1 November 2018 after the spacecraft ran out of fuel. Doraemon (Japanese: ドラえもん) is a Japanese manga series written and illustrated by Fujiko F. Fujio, the pen name of the duo Hiroshi Fujimoto and Motoo Abiko. The series has also been adapted into a successful anime series and media franchise. The story revolves around a robotic cat named Doraemon, who travels back in time from the 22nd century to aid a boy named Nobita Nobi (野比のび太, Nobi Nobita). The Doraemon manga series was first published in December 1969 in six different magazines. A total of 1,345 stories were created in the original series, which are published by Shogakukan. It is one of the best-selling manga in the world, having sold over 100 million copies as of 2015. The volumes are collected in the Takaoka Central Library in Toyama, Japan, where Fujiko Fujio was born. Turner Broadcasting System bought the rights to the Doraemon anime series in the mid-1980s for an English-language release in the United States, but cancelled it without explanation before broadcasting any episodes. In July 2013, Voyager Japan announced the manga would be released digitally in English via the Amazon Kindle e-book service. Awards for Doraemon include the Japan Cartoonists Association Award for excellence in 1973, the first Shogakukan Manga Award for children's manga in 1982, and the first Osamu Tezuka Culture Award in 1997. In March 2008, Japan's Foreign Ministry appointed Doraemon as the nation's first "anime ambassador." A Ministry spokesperson explained the novel decision as an attempt to help people in other countries understand Japanese anime better and to deepen their interest in Japanese culture.The Foreign Ministry action confirms that Doraemon has come to be considered a Japanese cultural icon. In India, its Hindi, Telugu and Tamil translation has been telecasted, where the anime version is the highest-rated kids' show; winning the Best Show For Kids award twice at the Nickelodeon Kids' Choice Awards India in 2013 and 2015. In 2002 Time Asia magazine acclaimed the character as an "Asian Hero" in a special feature survey. An edited English dub distributed by TV Asahi aired on Disney XD in the United States started on July 7, 2014. In the Epcot theme park at Florida's Walt Disney World, Doraemon toys are on the Japan shop. On August 17, 2015, another English dubbed version distributed by Luk Internacional began broadcasting on Boomerang UK. The film series is the largest by number of admissions in Japan. A dwarf planet is a planetary-mass object that is neither a true planet nor a natural satellite. That is, it is in direct orbit of a star, and is massive enough for its gravity to compress it into a hydrostatically equilibrious shape (usually a spheroid), but has not cleared the neighborhood of other material around its orbit.The term dwarf planet was adopted in 2006 as part of a three-way categorization of bodies orbiting the Sun, brought about by an increase in discoveries of objects farther away from the Sun than Neptune that rivaled Pluto in size, and finally precipitated by the discovery of an even more massive object, Eris. The exclusion of dwarf planets from the roster of planets by the IAU has been both praised and criticized.As of July 2008 the International Astronomical Union (IAU) recognizes five dwarf planets: Ceres in the asteroid belt, and Pluto, Haumea, Makemake, and Eris in the outer Solar System.Only two of these bodies, Ceres and Pluto, have been observed in enough detail to demonstrate that they actually fit the IAU's definition. The IAU accepted Eris as a dwarf planet because it is more massive than Pluto. They subsequently decided that unnamed trans-Neptunian objects with an absolute magnitude brighter than +1 (and hence a diameter of ≥838 km assuming a geometric albedo of ≤1) are to be named under the assumption that they are dwarf planets. At the time (and still as of 2019), the only additional bodies to meet this secondary criterion were Haumea and Makemake. However, doubts have since been raised about Haumea. Earth is the third planet from the Sun and the only astronomical object known to harbor life. According to radiometric dating and other sources of evidence, Earth formed over 4.5 billion years ago. Earth's gravity interacts with other objects in space, especially the Sun and the Moon, Earth's only natural satellite. Earth revolves around the Sun in 365.26 days, a period known as an Earth year. During this time, Earth rotates about its axis about 366.26 times.Earth's axis of rotation is tilted with respect to its orbital plane, producing seasons on Earth. The gravitational interaction between Earth and the Moon causes ocean tides, stabilizes Earth's orientation on its axis, and gradually slows its rotation. Earth is the densest planet in the Solar System and the largest of the four terrestrial planets.Earth's lithosphere is divided into several rigid tectonic plates that migrate across the surface over periods of many millions of years. About 71% of Earth's surface is covered with water, mostly by oceans. The remaining 29% is land consisting of continents and islands that together have many lakes, rivers and other sources of water that contribute to the hydrosphere. The majority of Earth's polar regions are covered in ice, including the Antarctic ice sheet and the sea ice of the Arctic ice pack. Earth's interior remains active with a solid iron inner core, a liquid outer core that generates the Earth's magnetic field, and a convecting mantle that drives plate tectonics. Eris (minor-planet designation 136199 Eris) is the most massive and second-largest (by volume) dwarf planet (and plutoid) known in the Solar System. Eris was discovered in January 2005 by a Palomar Observatory-based team led by Mike Brown, and its discovery was verified later that year. In September 2006 it was named after Eris, the Greek goddess of strife and discord. Eris is the ninth most massive object directly orbiting the Sun, and the 16th most massive overall, because seven moons are more massive than all known dwarf planets. It is also the largest which has not yet been visited by a spacecraft. Eris was measured to be 2,326 ± 12 kilometers (1,445.3 ± 7.5 mi) in diameter. Eris's mass is about 0.27% of the Earth mass, about 27% more than dwarf planet Pluto, although Pluto is slightly larger by volume.Eris is a trans-Neptunian object (TNO) and a member of a high-eccentricity population known as the scattered disk. It has one known moon, Dysnomia. As of February 2016, its distance from the Sun was 96.3 astronomical units (1.441×1010 km; 8.95×109 mi), roughly three times that of Pluto. With the exception of some long-period comets, until 2018 VG18 was discovered on December 17, 2018, Eris and Dysnomia were the most distant known natural objects in the Solar System.Because Eris appeared to be larger than Pluto, NASA initially described it as the Solar System's tenth planet. This, along with the prospect of other objects of similar size being discovered in the future, motivated the International Astronomical Union (IAU) to define the term planet for the first time. Under the IAU definition approved on August 24, 2006, Eris is a "dwarf planet", along with objects such as Pluto, Ceres, Haumea and Makemake, thereby reducing the number of known planets in the Solar System to eight, the same as before Pluto's discovery in 1930. Observations of a stellar occultation by Eris in 2010 showed that its diameter was 2,326 ± 12 kilometers (1,445.3 ± 7.5 mi), very slightly less than Pluto, which was measured by New Horizons as 2,372 ± 4 kilometers (1,473.9 ± 2.5 mi) in July 2015. An exoplanet () or extrasolar planet is a planet outside the Solar System. The first evidence of an exoplanet was noted in 1917, but was not recognized as such. The first scientific detection of an exoplanet was in 1988; it was confirmed to be an exoplanet in 2012. The first confirmed detection occurred in 1992. As of 1 April 2019, there are 4,023 confirmed planets in 3,005 systems, with 656 systems having more than one planet.There are many methods of detecting exoplanets. Transit photometry and Doppler spectroscopy have found the most, but these methods suffer from a clear observational bias favoring the detection of planets near the star; thus, 85% of the exoplanets detected are inside the tidal locking zone. 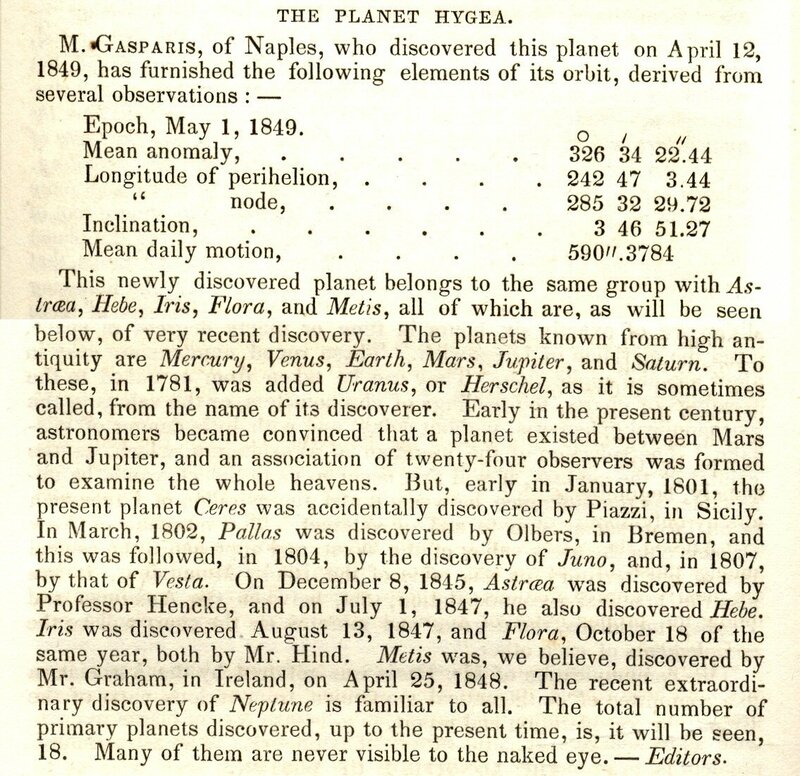 In several cases, multiple planets have been observed around a star. About 1 in 5 Sun-like stars have an "Earth-sized" planet in the habitable zone. Assuming there are 200 billion stars in the Milky Way, it can be hypothesized that there are 11 billion potentially habitable Earth-sized planets in the Milky Way, rising to 40 billion if planets orbiting the numerous red dwarfs are included.The least massive planet known is Draugr (also known as PSR B1257+12 A or PSR B1257+12 b), which is about twice the mass of the Moon. The most massive planet listed on the NASA Exoplanet Archive is HR 2562 b, about 30 times the mass of Jupiter, although according to some definitions of a planet (based on the nuclear fusion of deuterium), it is too massive to be a planet and may be a brown dwarf instead. There are planets that are so near to their star that they take only a few hours to orbit and there are others so far away that they take thousands of years to orbit. Some are so far out that it is difficult to tell whether they are gravitationally bound to the star. Almost all of the planets detected so far are within the Milky Way. Nonetheless, evidence suggests that extragalactic planets, exoplanets farther away in galaxies beyond the local Milky Way galaxy, may exist. The nearest exoplanet is Proxima Centauri b, located 4.2 light-years (1.3 parsecs) from Earth and orbiting Proxima Centauri, the closest star to the Sun.The discovery of exoplanets has intensified interest in the search for extraterrestrial life. There is special interest in planets that orbit in a star's habitable zone, where it is possible for liquid water, a prerequisite for life on Earth, to exist on the surface. The study of planetary habitability also considers a wide range of other factors in determining the suitability of a planet for hosting life.Besides exoplanets, there are also rogue planets, which do not orbit any star. These tend to be considered as a separate category, especially if they are gas giants, in which case they are often counted as sub-brown dwarfs, like WISE 0855−0714. The rogue planets in the Milky Way possibly number in the billions (or more). has "cleared the neighborhood" around its orbit.Among other things, this definition caused Pluto to no longer be a planet, a change from how it had been widely considered until that point. A non-satellite body fulfilling only the first two of these criteria (such as Pluto) is classified as a "dwarf planet". 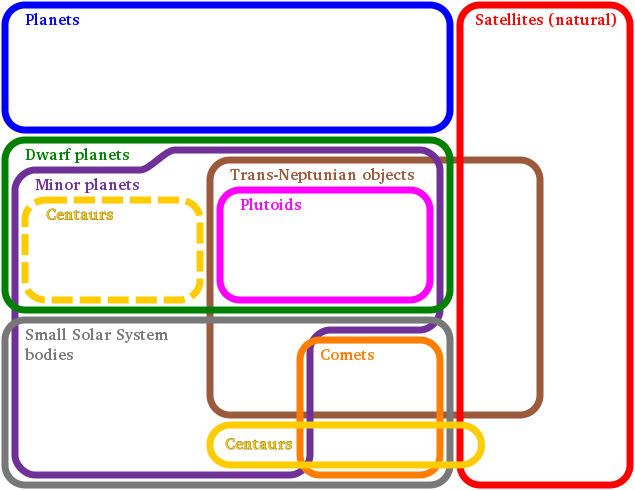 According to the IAU, "planets and dwarf planets are two distinct classes of objects". A non-satellite body fulfilling only the first criterion is termed a "small Solar System body" (SSSB). An alternate proposal included dwarf planets as a subcategory of planets, but IAU members voted against this proposal. The definition was a controversial one, and has drawn both support and criticism from different astronomers, but has remained in use. According to this definition, there are eight known planets in the Solar System. The definition distinguishes planets from smaller bodies and is not applicable outside the Solar System. To date, there is no accepted definition of extrasolar planets, or exoplanets. In 2007, an IAU working group issued a position statement that proposes to distinguish exoplanets from brown dwarfs on the basis of mass, but there has been no IAU-wide resolution or vote associated with this position statement. A separate proposal to extend the IAU definition to exoplanets has not been formally reviewed by the IAU. There are ongoing investigations assessing the past habitability potential of Mars, as well as the possibility of extant life. Future astrobiology missions are planned, including the Mars 2020 and ExoMars rovers. Liquid water cannot exist on the surface of Mars due to low atmospheric pressure, which is less than 1% of the Earth's, except at the lowest elevations for short periods. The two polar ice caps appear to be made largely of water. The volume of water ice in the south polar ice cap, if melted, would be sufficient to cover the entire planetary surface to a depth of 11 meters (36 ft). In November 2016, NASA reported finding a large amount of underground ice in the Utopia Planitia region of Mars. The volume of water detected has been estimated to be equivalent to the volume of water in Lake Superior.Mars can easily be seen from Earth with the naked eye, as can its reddish coloring. Its apparent magnitude reaches −2.94, which is surpassed only by Jupiter, Venus, the Moon, and the Sun. Optical ground-based telescopes are typically limited to resolving features about 300 kilometers (190 mi) across when Earth and Mars are closest because of Earth's atmosphere. Mercury is tidally locked with the Sun in a 3:2 spin-orbit resonance, and rotates in a way that is unique in the Solar System. As seen relative to the fixed stars, it rotates on its axis exactly three times for every two revolutions it makes around the Sun. As seen from the Sun, in a frame of reference that rotates with the orbital motion, it appears to rotate only once every two Mercurian years. An observer on Mercury would therefore see only one day every two Mercurian years. Mercury's axis has the smallest tilt of any of the Solar System's planets (about ​1⁄30 degree). Its orbital eccentricity is the largest of all known planets in the Solar System; at perihelion, Mercury's distance from the Sun is only about two-thirds (or 66%) of its distance at aphelion. Mercury's surface appears heavily cratered and is similar in appearance to the Moon's, indicating that it has been geologically inactive for billions of years. Having almost no atmosphere to retain heat, it has surface temperatures that vary diurnally more than on any other planet in the Solar System, ranging from 100 K (−173 °C; −280 °F) at night to 700 K (427 °C; 800 °F) during the day across the equatorial regions. The polar regions are constantly below 180 K (−93 °C; −136 °F). The planet has no known natural satellites. Two spacecraft have visited Mercury: Mariner 10 flew by in 1974 and 1975; and MESSENGER, launched in 2004, orbited Mercury over 4,000 times in four years before exhausting its fuel and crashing into the planet's surface on April 30, 2015. The BepiColombo spacecraft is planned to arrive at Mercury in 2025. Planet Nine is a hypothetical planet in the outer region of the Solar System. Its gravitational effects could explain the unusual clustering of orbits for a group of extreme trans-Neptunian objects (eTNOs), bodies beyond Neptune that orbit the Sun at distances averaging more than 250 times that of the Earth. These eTNOs tend to make their closest approaches to the Sun in one sector, and their orbits are similarly tilted. These improbable alignments suggest that an undiscovered planet may be shepherding the orbits of the most distant known Solar System objects.This undiscovered super-Earth-sized planet would have a predicted mass of five to ten times that of the Earth, and an elongated orbit 400 to 800 times as far from the Sun as the Earth. Konstantin Batygin and Michael E. Brown suggest that Planet Nine could be the core of a giant planet that was ejected from its original orbit by Jupiter during the genesis of the Solar System. Others propose that the planet was captured from another star, was once a rogue planet, or that it formed on a distant orbit and was pulled into an eccentric orbit by a passing star.As of the end of 2018, no observation of Planet Nine had been announced. While sky surveys such as Wide-field Infrared Survey Explorer (WISE) and Pan-STARRS did not detect Planet Nine, they have not ruled out the existence of a Neptune-diameter object in the outer Solar System. The ability of these past sky surveys to detect Planet Nine were dependent on its location and characteristics. Further surveys of the remaining regions are ongoing using NEOWISE and the 8-meter Subaru Telescope. Unless Planet Nine is observed, its existence is purely conjectural. Several alternative theories have been proposed to explain the observed clustering of TNOs. Planet of the Apes is an American science fiction media franchise consisting of films, books, television series, comics, and other media about a world in which humans and intelligent apes clash for control. The franchise is based on French author Pierre Boulle's 1963 novel La Planète des singes, translated into English as Planet of the Apes or Monkey Planet. Its 1968 film adaptation, Planet of the Apes, was a critical and commercial hit, initiating a series of sequels, tie-ins, and derivative works. Arthur P. Jacobs produced the first five Apes films through APJAC Productions for distributor 20th Century Fox; since his death in 1973, Fox has controlled the franchise. Four sequels followed the original film from 1970 to 1973: Beneath the Planet of the Apes, Escape from the Planet of the Apes, Conquest of the Planet of the Apes and Battle for the Planet of the Apes. They did not approach the critical acclaim of the original, but were commercially successful, spawning two television series in 1974 and 1975. Plans for a film remake stalled in "development hell" for over ten years before Tim Burton's Planet of the Apes was released in 2001. A reboot film series commenced in 2011 with Rise of the Planet of the Apes, which was followed by Dawn of the Planet of the Apes in 2014 and War for the Planet of the Apes in 2017. The films have grossed a total of over US$2 billion worldwide, against a combined budget of $567.5 million. Along with further narratives in various media, franchise tie-ins include video games, toys and planned theme park rides. Planet of the Apes has received particular attention among film critics for its treatment of racial issues. Cinema and cultural analysts have also explored its Cold War and animal rights themes. The series has influenced subsequent films, media and art, as well as popular culture and political discourse. Saturn's interior is probably composed of a core of iron–nickel and rock (silicon and oxygen compounds). This core is surrounded by a deep layer of metallic hydrogen, an intermediate layer of liquid hydrogen and liquid helium, and finally a gaseous outer layer. Saturn has a pale yellow hue due to ammonia crystals in its upper atmosphere. Electrical current within the metallic hydrogen layer is thought to give rise to Saturn's planetary magnetic field, which is weaker than Earth's, but has a magnetic moment 580 times that of Earth due to Saturn's larger size. Saturn's magnetic field strength is around one-twentieth of Jupiter's. The outer atmosphere is generally bland and lacking in contrast, although long-lived features can appear. Wind speeds on Saturn can reach 1,800 km/h (1,100 mph; 500 m/s), higher than on Jupiter, but not as high as those on Neptune. In January 2019, astronomers reported that a day on the planet Saturn has been determined to be 10h 33m 38s + 1m 52s− 1m 19s , based on studies of the planet's C Ring.The planet's most famous feature is its prominent ring system that is composed mostly of ice particles, with a smaller amount of rocky debris and dust. At least 62 moons are known to orbit Saturn, of which 53 are officially named. This does not include the hundreds of moonlets in the rings. Titan, Saturn's largest moon, and the second-largest in the Solar System, is larger than the planet Mercury, although less massive, and is the only moon in the Solar System to have a substantial atmosphere. As one of the brightest objects in the sky, Venus has been a major fixture in human culture for as long as records have existed. It has been made sacred to gods of many cultures, and has been a prime inspiration for writers and poets as the morning star and evening star. Venus was the first planet to have its motions plotted across the sky, as early as the second millennium BC.As the planet with the closest approach to Earth, Venus has been a prime target for early interplanetary exploration. It was the first planet beyond Earth visited by a spacecraft (Mariner 2 in 1962), and the first to be successfully landed on (by Venera 7 in 1970). Venus's thick clouds render observation of its surface impossible in visible light, and the first detailed maps did not emerge until the arrival of the Magellan orbiter in 1991. Plans have been proposed for rovers or more complex missions, but they are hindered by Venus's hostile surface conditions.